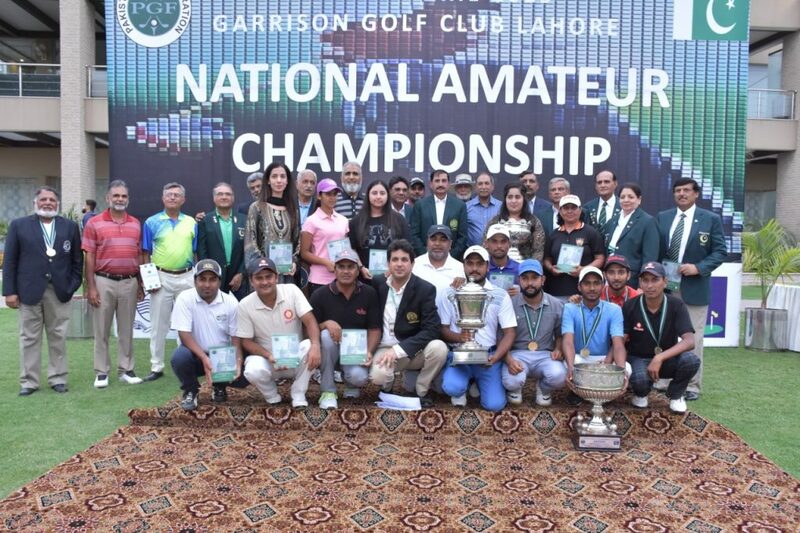 The 58th National Amateur Golf Championship 2019 came to a cessation after four rounds of relentless and intense golfing for the competing champions who were striving for a cling at the National Golf Title at the demanding Garrison Golf Course. The victorious and vanquished one turned out to be Taimoor Khan of PAF who achieved ascendancy and triumph, by first excelling over the final eighteen holes, leveling scores with his rival Abdul Zahoor of Multan and then beating him in a sudden death playoff that lasted two holes. It was a fortunate day for Taimoor Khan who carded the final days eighteen holes with a round of gross 69, through a five holes birdie blitz that brought him at par with Zahoor and entitled him to fight it out with his ferocious adversary, Abdul Zahoor. Abdul Zahoor lost it in the sudden death play off was due to Taimoor’s stunning hitting. In the final go Taimoor had scores of 76,72 ,73 and 69 and a four rounds aggregate of 290. As for Zahoor, he put up a great display of golf but had to concede victory to Taimoor Khan who is now the National Golf champion for 2019. Zulfiqar Ali (Multan) came third with a score of 291, Wazir Ali (Gymkhana) was fourth. His score was 292 and Zohaib Asif (DHA Karachi) came fifth ending the championship at a score of 292. Net section winner was Raja Israr (Garden city), while second net went to Mohsen Zafar (Gymkhana) and Robin Bagh (Gymkhana ) secured third net. The Ladies section title winner was Rimsha Ijaz (Defence Raya) through flawless golf. Her scores for the three days are 76, 76 and 73. Second gross went to Hamna Amjad (PAF). She managed aggregate score of 235. Ghazala Yasmin (Garrison) came third with score of 240. Other Results: Senior Amateurs; Rustam Ali Chatta (Garrison) first gross; Lt Col(r)Asif Mehdi (Garrison) second gross; Lt Col(r)Waqar Ahmed Khan (Defence Raya) third gross; Rashid Akbar (Garrison) first net; Lt Col. (r) Ikram ul Haq (Garrison) second net; Maj. Shoaib (Rawalpindi) third net. At the conclusion of the 58th National Amateur Golf Championship, the prizes were awarded to the players by Lt Gen (r) Hilal Hussain President, Pakistan Golf federation, Lt Gen(r)Khalid Maqbool, former Governor Punjab and Dr Asma Afzal Shami, Head of Ladies Golf in a prize distribution ceremony attended by Asad I.A.Khan, Vice President, PGF, Brig Shoaib bin Akram, President Garrison Golf Club, Dr Ali of PGF and participating golfers. President PGF announced that two new golf courses are coming up in Balochistan, one in Lahore and PGF is striving for excellence in the golfing arenas.